What Are Stackers and Why Do I Need Them in My Warehouse? Stackers are a light-duty lift alternative to heavier-duty lift equipment such as forklifts. To learn more about Stackers, please contact S.W. Betz. Your warehouse is probably filled with pallets upon pallets of products. Pallets are one of the most popular ways to ship items. They are cheap to manufacture and they are easy to move…if you have the right equipment. Do you? While forklifts get all of the attention, they are expensive and quite large. They are simply not an option for every business. You may not have much room or the need for that level of pallet-moving power. The solution: Stackers. Initial Investment: Stackers do not represent the same level of financial investment as forklifts, making stackers a more economical choice. For this reason alone, stackers are the preferred choice for smaller businesses throughout Maryland. Certification: Operating a forklift requires certain certifications. Stackers, meanwhile, can be easily operated by any trained employee. Maneuverability: Stackers are ideal for crowded and compact work areas, offering many of the benefits of larger forklifts without any of the hassles. Because they are smaller than forklifts, both manual and electric stackers offer easy maneuverability as well as smooth lifting capabilities. 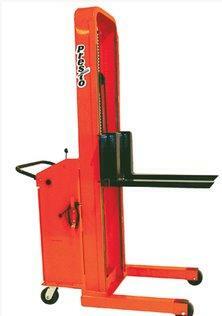 Manual stackers can lift to maximum heights of around 80 inches, while powered stackers can go above 150 inches. Maintenance: Manual stackers, for example, require minimal maintenance and upkeep. Powered stackers are commonly found in warehouses, loading docks, light assembly work cells, retail sales floors, and more. Where Can I Buy Manual or Electric Stackers in Maryland? The S.W. Betz Company, Inc. has been providing businesses in Maryland and beyond with all of their essential Weighing, Material Handling, Dock, and Warehouse equipment since 1933. We have a long history of dealing with many different stackers over the years for a variety of applications. The S. W. Betz Company is a proud distrubtor for some of the most reputable manufacturers in the industry, including Presto Lifts and Wesco . If you would like to learn more about Stackers, please contact S.W. Betz by calling 410-574-1414 or 800-332-0322 today! You can count on the S.W. Betz Company to work with you and provide you with our extensive knowledge of the industry. This entry was posted on Wednesday, September 9th, 2015 at 3:16 pm. Both comments and pings are currently closed.